One of my passions is teaching people to create their own simple recipes, by demonstrating how to take an existing recipe and break it down to its components. When I'm instructing people on this concept, I typically use basic vinaigrette as an example. The dressing is primarily made of two building blocks: fat and something acidic. Once you think about it that way, you can swap fats and acidic ingredients in and out in endless combinations. Schmaltz and red wine vinegar would work, for instance, as would walnut oil and lemon juice. And butter. Specifically nutty, browned butter, which makes an incredibly lush salad dressing. Once I realized that, I couldn't stop making the stuff. 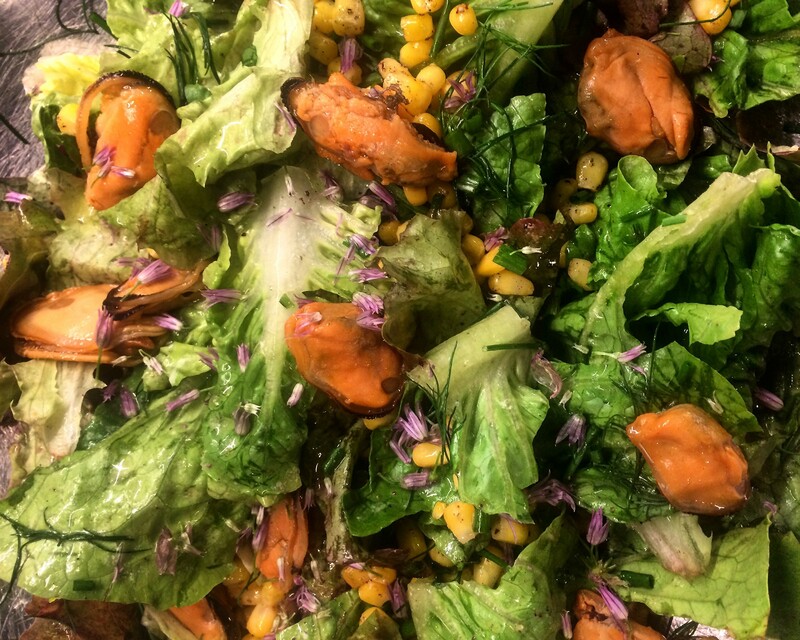 Recently, I used it on a salad made with lettuce, sautéed corn, smoked mussels, chive blossoms, chives and dill. It was one of the best salads I've ever eaten. In a heavy-bottomed pot, heat the butter over medium heat. Let cook until the milk proteins have settled on the bottom of the pot and have turned chestnut brown. Measure out 2/3 cup of browned butter, and reserve the rest for other uses. Combine with all the other ingredients. If you have an immersion blender, you'll want the ingredients in a tall, slender container in which you can blend them. You can also use a regular blender or food processor. Blend. It should make a thick emulsified dressing. Because butter solidifies when it's cold, it's best to toss this dressing with salads that are at room temperature. Store in the refrigerator, but bring to room temperature before using. Note: This dressing is intentionally highly seasoned, as I use a small quantity and barely coat the greens. Taste after dressing to see if the salad needs additional salt, pepper or vinegar.